The kingsnake and king cobra, while both snakes, are entirely different. From habitat to habits, these snakes have many key, unmistakable differences. The common kingsnake, according to Desert USA, is typically between two and four feet long, although some can grow to seven feet. Kingsnakes are known for their attractive, glossy skins. Their colors are white, tan, yellow, red, and black, with many varieties of bands, spots and stripes. The kingsnake has prominent eyes. The king cobra is the longest venomous snake on earth, according to the Philadelphia Zoo. It is usually between 12 and 15 feet, but capable of growing as long as 18 feet. The king cobra's skin is usually brown, black, or olive, with a paler underbelly. Its most striking feature is its hood, which flares out along its upper neck. The kingsnake is nonvenomous. Instead, it is a constrictor, meaning that it kills its prey by suffocation. The king cobra, however, is highly venomous, according to National Geographic. One bite is potent enough to kill an elephant, or approximately 20 people. The kingsnake is a very capable predator. It hunts small birds and mammals, frogs, and reptiles, including other snakes. It has a natural resistance to the venom of other snakes, such as rattlesnakes. However, as it is nonvenomous, the kingsnake has a few interesting behaviors. When it feels threatened, it can mimic the rattle of a rattlesnake by vibrating its tail. It can also emit a loud hiss, play dead or even produce a foul-smelling musk. In general, the kingsnake is quiet and not particularly aggressive. The king cobra is also a talented predator. It typically eats eggs, small mammals and reptiles, including other snakes. It has the ability to rear up and flare its hood when threatened. In addition, its hiss is said to resemble a growling dog. Unless it feels threatened, however, the king cobra is shy and avoids human contact. It is the only snake that builds a nest for its young. The kingsnake, which includes eight subspecies, has a vast territory. Its range extends from upper South America to lower Canada, and spans both coasts. It can inhabit forests, deserts, seasides, shrublands and plains. It is attracted to areas with vegetation, which provides natural cover. The king cobra lives on the opposite side of the world, inhabiting southern China, India, Indonesia, the Philippines and other parts of Southeast Asia. It is attracted to water, though it often lives in both forests and plains. The kingsnake is a very popular pet, due to its attractive skin and quiet nature. As long as it is properly cared for, the kingsnake makes an ideal pet snake for families. Of course, any snake-owning family should take precautions to educate all family members about proper etiquette around the snake, to prevent any potential accidents. 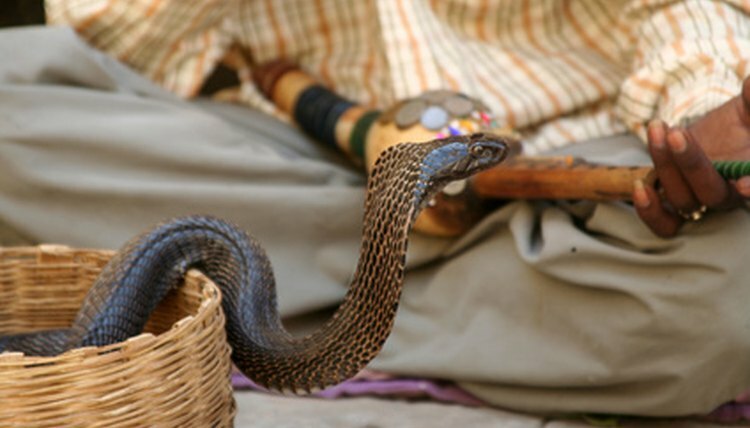 The king cobra, due to its venom and large size, does not make a good pet snake. While laws on ownership of venomous snakes are vague, anyone owning a king cobra would be putting all pets and family members at risk.